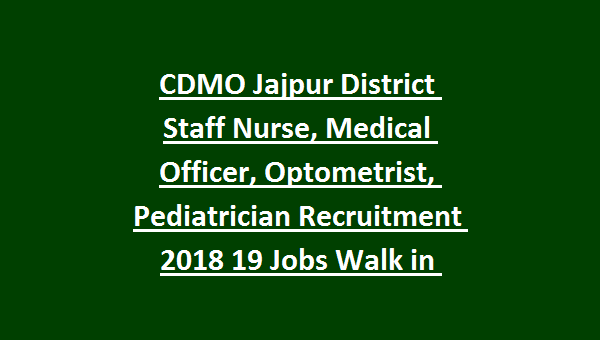 CDMO Health Department Jajpur District Recruitment 2018: Office of the Chief District Medical Officer, Jajpur district released notification to recruit the available paramedical posts under Health and Family Welfare Department of Staff Nurse, Medical Officer, Optometrist and Pediatrician posts on contractual basis. Selection for this recruitment will be based marks secured in academic qualifications, skill test and interview. There are total 19 vacancies available in this CDMO Jajpur District recruitment. Eligible candidates may attend the walk in interview as per given dates. 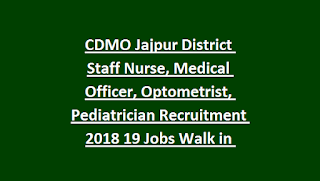 For more information regarding this CDMO Jajpur District health Department Staff Nurse, Medical Officer recruitment please see the information below. There are total 19 posts available in Odisha Jajpur District Health Department. For Staff Nurse jobs- Age limit are 21-32 years for SC/ST/SEBC candidates 5 years and for PH/Ex-Serviceman 10 years of age relaxation will be given. The candidates must have knowledge in Odiya Speaking, Writing and Reading. Must have studied up to matriculation in Odiya language or odiya is one of the subject. Must have completed B.Sc Nursing or Diploma in GNM course from recognized institute or university after 10+2 in Science stream. The candidate must have registered with Indian Nursing Council as well as Odisha Nursing Council. The candidate must have qualified Diploma in Medical Laboratory Technology (DMLT) from a recognized university or institute. The candidate must have qualified Diploma in Medical Radiation Technology (DMRT) from a recognized university or institute. Must have qualified diploma in a Pharmacy from a recognized university. Must have qualified Diploma in General Nursing and Midwifery Course. Selection will be held based on marks secured in Academic Qualifications, Skill Test and interview for Staff Nurse posts. For other posts academic qualifications merit & interview will be conducted. Eligible candidates can attend the walk in interview as per given dates along with below mentioned documents. Candidates are required to attach the following documents along with the application form. 1. One self attested recent passport size color photograph duly pasted at the designated space. 2. Self attested copies of mark sheets and certificate. 3. Self attested copy of state council registration certificate. 6. Self attested copy of valid employment registration certificate. 7. In service candidates should submit their service certificate from the competent authority. 8. If any other related documents.